Recently, the impacts of climate change on fisheries have been in the news. The emphasis has been on the inability of scientists to explain how climate change is affecting fisheries or to fix the problems it seems to be causing. These include shifting distribution and abundance patterns of commercially valuable fish stocks – shifts that may leave fishermen stranded with very restrictive catch limits, even when they have been doing everything possible to protect and restore their stocks. These problems are being felt acutely in New England, where catch of some valuable stocks has been highly restricted to rebuild stocks depleted by overfishing – but they face even more restrictions as scientists find less fish in the water, possibly due to migrations induced by climate change. A better scientific understanding of how climate change influences the distribution and abundance of fish is certainly needed, but that may be less important than the need for more flexible human institutions that can rapidly adjust to those changes. The fact that we’ve allowed greenhouse gases to accumulate in the atmosphere means that the ocean has warmed too. The ocean is even more resistant to remediation efforts than the atmosphere due to its enormous thermal inertia. 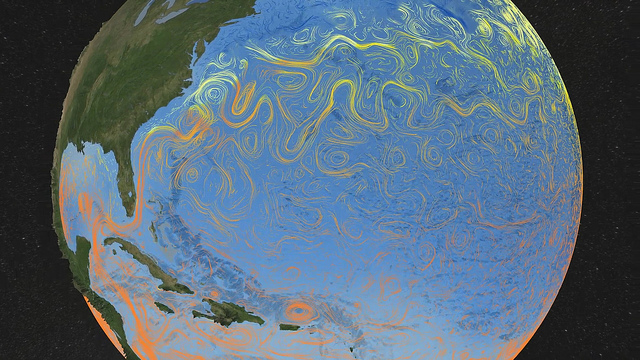 The ocean will hang on to that heat for decades, resulting in changing temperatures at sea. Because fish favor certain ranges of temperatures over others, this should cause fish stocks to migrate in pursuit of their favorite temperatures. A new study shows that catch composition has been changing over the last several decades in ways that support this hypothesis: warmer water species are being caught in areas where catch used to be dominated by cold water species. This state of affairs demands institutions that are flexible and can adjust rapidly to changing conditions. Most fishery institutions, on the other hand, seem inflexible and incapable of rapid adjustment to a changing world. For example, the Pacific Salmon Treaty of 1985 allocated harvest of shared stocks of salmon to the United States and Canada based on average distributions. But then, changes in the distribution and abundance of salmon (which are prone to such changes, being migratory) resulted in a fish war between these two strong allies. In many other fisheries, too, declines in fish stocks have led to declines in allowable catch limits, leaving fisherman who invested in boats and gear during boom times saddled with debt. Catch share programs, in which shares of allowable catch are allocated to individuals or groups, are much more suitable to a world in which the climate is changing. Shareholders can buy or sell shares, allowing the fishery to contract or expand depending on how many fish are around. For example, fishing capacity had built up to high levels in the Pacific groundfish fishery, resulting in a federal buyout of about half of the capacity. However, the fishery was still constrained by very low catch limits for species depleted by decades of overfishing. Catch shares have allowed the fleet to adjust to these new catch limits by incentivizing fishermen to extract more value from their catch and engage in creative strategies to avoid catching the overfished species. Similarly, catch shares between nations can allow for much more flexibility to respond rationally to changes in fish abundance and distribution that span borders than agreements that set allocations based on average catch. Formal catch share programs between countries are still rare, but the potential can be illustrated with a few examples. The Pacific Salmon Treaty was modified so that catch allocations are now based on observed and projected abundance, rather than on negotiated shares, that account for variations in the distribution and abundance of the salmon. Fishing rights for Atlantic salmon on the high seas were exchanged for rights to harvest them nearshore in order to better conserve dwindling salmon stocks and increase the value of the harvest. Conversely, rights to fish declining tuna stocks nearshore (where the juveniles tend to congregate) have been swapped for rights to fish offshore (where the adults live) in order to protect the juveniles. One of the major reasons that tuna tend to be overfished is that they swim across borders, so none of the countries that benefit from the harvest feel responsible for conservation – and a country that implements conservation measures cannot benefit from those measures. So the profits of tuna harvest can be internalized, but the costs of failing to conserve tuna are externalized to everyone – a recipe for overfishing. An international catch share, in which a scientifically determined catch limit is allocated to fishing nations, has the potential to solve this perennial problem which has resulted in the depletion of many species of swordfish, marlin, and tuna – the fish that do not respect boundaries. Comanagement, in which power is shared between government agencies charged with protecting resources like fisheries and local groups charged with developing and implementing regulations to meet standards set by the government, may also help increase the adaptive capacity of our fishery management institutions. For example, Morro Bay’s cooperative fishery is held accountable to an overall catch limit by the federal government, but is responsible for day-to-day management. The small size of the cooperative allows it to identify and solve problems far more rapidly than the federal or state government agencies can. As a rule of thumb, smaller institutions that hold sway over smaller areas, over which they exert more control (with fewer outside authorities) tend to adapt more readily to change than large institutions that operate over large areas with lots of outside authorities. In the end, a better understanding of how climate change is affecting fish will allow us to set better catch limits and anticipate trends. But in addition to more science, we need more flexible institutions that can act quickly in response to changes in fish abundance and distribution. That’s the right way to minimize conflict and maintain catch, livelihoods, and fishing communities. This entry was posted in Domestic, International, Science/Research and tagged accountability, Climate change, data, ecosystem shift, fish distribution, Fisheries, Fisheries Management, science. Bookmark the permalink. Both comments and trackbacks are currently closed. Didn’t we all learn back in about 7th grade that in nature, everything affects everything? How is it that climate change is affecting the fisheries comes across as news? Isn’t it just common sense that our waters and fisheries would be affected too?